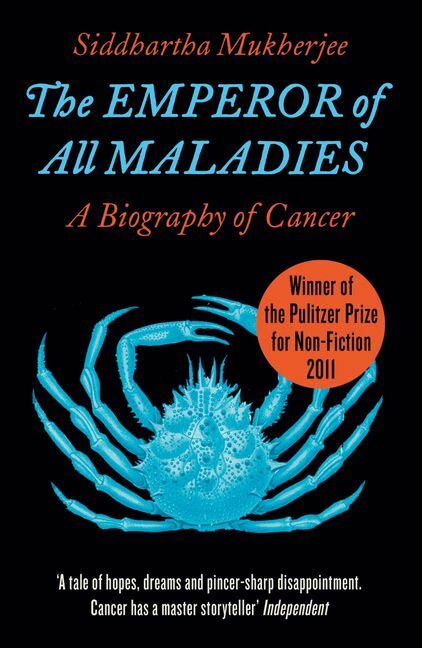 A magnificent, beautifully written biography of cancer – from its first documented appearances thousands of years ago through the epic battles to cure, control and conquer it, to a radical new understanding of its essence. In ‘The Emperor of All Maladies', Siddhartha Mukherjee, doctor, researcher and award-winning science writer, examines cancer with a cellular biologist's precision, a historian's perspective, and a biographer's passion. The result is an astonishingly lucid and eloquent chronicle of a disease humans have lived with – and perished from – for more than five thousand years. The story of cancer is a story of human ingenuity, resilience and perseverance, but also of hubris, arrogance and misperception, all leveraged against a disease that, just three decades ago, was thought to be easily vanquished in an all-out ‘war against cancer'. Mukherjee recounts centuries of discoveries, setbacks, victories and deaths, told through the eyes of predecessors and peers, training their wits against an infinitely resourceful adversary. From the Persian Queen Atossa, whose Greek slave cut off her malignant breast, to the nineteeth-century recipient of primitive radiation and chemotherapy and Mukherjee's own leukemia patient, Carla, The Emperor of All Maladies is about the people who have soldiered through toxic, bruising, and draining regimes to survive and to increase the store of human knowledge. Riveting and magesterial, ‘The Emperor of All Maladies' provides a fascinating glimpse into the future of cancer treatments and a brilliant new perspective on the way doctors, scientists, philosophers and lay people have observed and understood the human body for millennia. Siddhartha Mukherjee M.D., Ph.D., is a cancer physician and researcher. He is an assistant professor of medicine at Columbia University and a cancer physician at the CU/NYU Presbyterian Hospital. A Rhodes Scholar, he graduated from Stanford University, University of Oxford, and from Harvard Medical School and was a Fellow at the Dana Farber Cancer Institute and an attending physician at the Massachusetts General Hospital and Harvard Medical School. He has published articles in Nature, New England Journal of Medicine, Neuron, the Journal of Clinical Investigation, The New York Times, and The New Republic.He lives in New York with his wife and daughter.